On the 28th of January it was my little boys 3rd Birthday! Sitting here on my lunch break in work writing this has me wondering where 3 years has actually gone?! As always I bought him a few gifts because you can't have a birthday without some presents! As always I bought everything from PetBliss online. They are my go to pet shop for whatever the occasion just because I find they have such a great selection of items for small animals. Sheldon is really fussy when it comes to treats and 9/10 things the Pet Shops sell he won't eat. However the one treat he does love is the Burgess Excel Range. This is just things like mountain hay, herbs, pieces of fruit and all that sort of good stuff. So I got him two bags of that type of stuff and a box of Banana and Papaya snacks, which in reality I'm not sure he'll eat because he rathers fresh fruit over dried. I also bought him a huge cardboard tunnel that he can hide in and chew on, Pet Bliss also filled this with hay for me so it's keeping him entertained and full because he's eating so much. Finally I bought him two boredom breakers, although I'm not quite sure Sheldon is ever bored. Sheldon is very like me that he loves to sleep and eat, enjoys his own company and hates having to put energy into...well anything that involves food. Last year I bought him a ball that you can fill with treats and then you hang it from the top of the cage. He hates me when I put treats in it because it means he has to stretch and do a little bit of exercise to get the food! But that aside this year I bought him a little wooden caterpillar that he can just gnaw on, which I can't see happening. I also picked him up a mobile because it was the cutest thing ever, it has a rainbow in the middle and then a cloud and the sun either side with bells attached. He appreciated it for about 20 seconds and never looked at it again. But I mean it looks cute!! 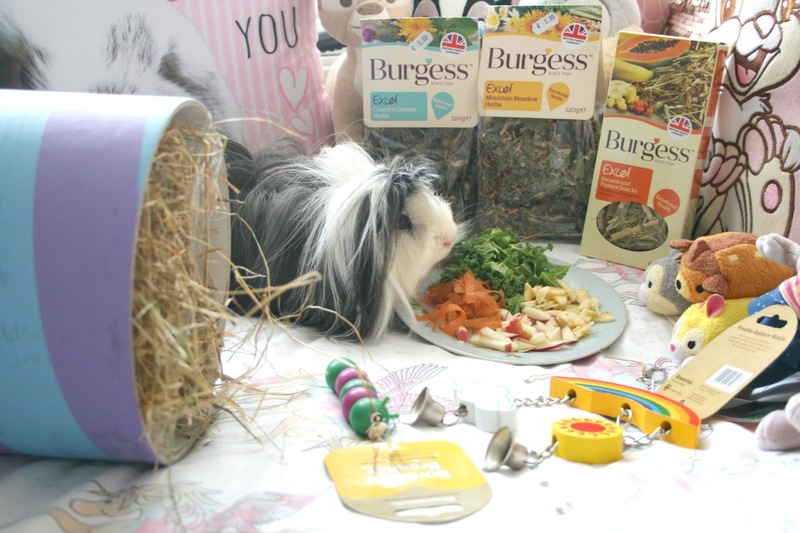 For his birthday meal, because Guineapigs can't have cake, even if they could he's so fussy he probably wouldn't eat it! He had a plate full of Banana, Kale, Carrott and Apple. After he cleared that (yes that little fellow cleared it all) he moved on to his tunnel to munch on some hay for a few hours. A nap was involved after that. Happy (late, because this post didn't go up on the actual day) Birthday little boy, I adore you!